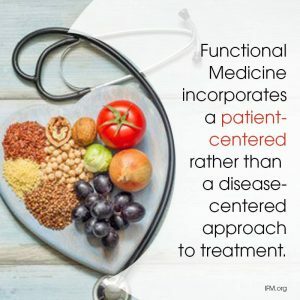 The Functional Medicine model is an individualized, patient-centered, science-based approach that empowers patients and practitioners to work together to address chronic disease and promote optimal wellness. Functional Medicine asks how and why illness occurs and restores health by addressing the root causes of disease for each individual. Functional Medicine treatments include a combination of nutrition and lifestyle modification, natural supplements, health coaching, lab testing, and education of the patient, which empowers them to take charge of their own health. For more information on Functional Medicine click here to visit The Institute for Functional Medicine website. Contact us to set up a Consult with Dr. Pomplun. For more information on Functional Medicine at ChiroPlus Click Here.